In addition to the other services we provide, Lincoln Memorial Park is able to assist you with selecting the design and personalization of your loved one’s memorial. At Lincoln Memorial Park, our family services counselors will help design a memorial that captures the essence of your loved one. Your design experience includes your choice of memorial design, memorial color, granite color, personalized endearment phrase wording, choice of emblems or vases and even a personal picture. Memorials, like people, come in an almost infinite number of designs and styles, but typically they fall into two categories: in-ground and upright monuments. 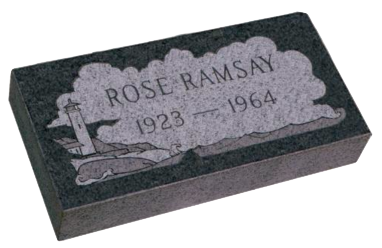 In-ground memorials are flush with the ground and can be made of solid granite that is then engraved to your specifications or a bronze plaque which is cast and then installed on a granite base. Upright monuments rise several feet above the ground, are made of granite and are designed to last for centuries. We will work with you to decide all aspects of your memorial design. With thousands of designs and emblems to choose from, and our ability to make virtually any custom emblem, your custom memorial can feature anything from motorcycles or fishing boats to gardening or pizza. Additionally, we can even engrave a picture of your loved one in bronze or have their photo engraved on a granite memorial. Lincoln Memorial Park also offers a number of floral vase designs in bronze, granite, aluminum and zinc. Floral vases can either be part of the design of a memorial or they can be installed in addition to a memorial as a separate unit. Bronze markers are flush (lawn-level) memorials permitted in every section of the cemetery. Bronze Memorials come in various types: Individual, Companion, Infant and Double Interment. Bronze markers can be mounted on a granite base which frame the bronze in a stately fashion. Bronze markers are fully customizable including colors, font style and size, design, and vases or personal emblems that reflect a loved one’s hobbies or religious beliefs. Photos can be added for an extra personal touch. Family service counselors can design your marker using computer software so you can see the end result before it’s even sent to our vendor. Granite markers are available in several sections within the cemetery. They are available in both flush companion and individual sizes, with a wide range of colors and hundreds of design options, and can include an engraved photo if desired.